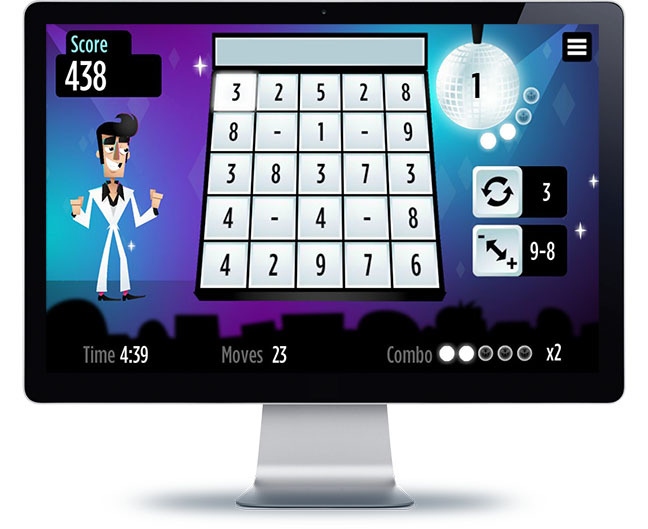 In this 70s Disco themed counting game, you will need to prove your analytical skills by making sums that add up to the value pre-established at the disco ball. The more tiles you use in the equation, the more points you will earn and the more Disco Donnie will show you his moves! Have fun testing your mathematical skills and be ready to boogie on the dancefloor! In this game you create sums that matches the value target at the disco ball. For this, you need to select the titles with the number values and also the equation signs ones. Pay attention to the value target because it changes in every 4 sums that are made. Also, you will receive more points for using more titles for the same equation and making more corrects equations in a row increases your combo meter. There is a bonus target that enable a button which allows you to change some operators.